The Broke and the Bookish : Lori's Review of "Every Day by the Sun"
I remember seeing a blurb about this book as it was just coming out. I was pretty interested in it because Faulkner is one of my favorite authors. However, as per usual, it took me a while to really get around to it. One of my good friends began reading the memoir and, knowing my love of Faulkner, raved to me. Once I found out that the 50th anniversary of his death was on July 6 and it was July 5, I decided to make it a goal to read this tome in one day. It's only 261 pages. I wound up finishing on the 7th (damn sleep! )...which was the 50th anniversary of when he was buried. I still count it as a win. So, the book was written by Faulkner's niece, whom he practically raised. Dean Faulkner was William's youngest brother. Dean died in an airplane accident just months before his wife was to give birth to their first child. Dean's wife gave birth to a daughter, whom she named Dean. William decided to take responsibility for making sure Dean (niece) lived a good life because he felt responsible for Dean's (brother) death (William was, after all, the one who introduced Dean to airplanes). From there, Faulkner Wells relates the story of her life and William's impact upon it. 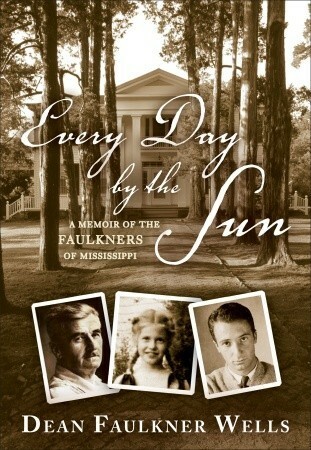 Faulkner practically supported several members of his family in Oxford, Mississippi for much of his writing career. He never stopped to think about what it was costing him, he just did it. He provided food, lodging, and other opportunities to many relatives. Faulkner Wells mainly focuses on illuminating the life of William Faulkner through telling her life story. Naturally, she spends a couple of chapters telling the family history of the Faulkners (or Falkners, as some branches of the family spelled their name). She tells heart-warming and heart-wrenching stories about Faulkner's kindness and troubles. One of the more bittersweet moments, in my opinion, was when Faulkner's four-year-old step-grand-daughter was sent from Shanghai to Tennessee in 1941 (when the Japanese were about to invade) with a note safety-pinned to her coat "Please get me to William Faulkner in Oxford, Mississippi." I don't know why, but the thought of a four-year-old making a transcontinental flight all alone with such a note just gets to me. I strongly recommend this book to anyone who is interested in learning more about William Faulkner from the eyes of someone who was very close to him. I like how this book was written by someone close to him. It feels like that would add an even greater authenticity to the book!